The Paradise Cut Bypass Expansion Project is a multi-benefit project that would reduce flood risk and improve habitat while maintaining agricultural land along the San Joaquin River near Manteca. The project would increase the flood conveyance capacity by lengthening and widening Paradise Cut and constructing a second weir to allow more floodwaters to overflow into the bypass. 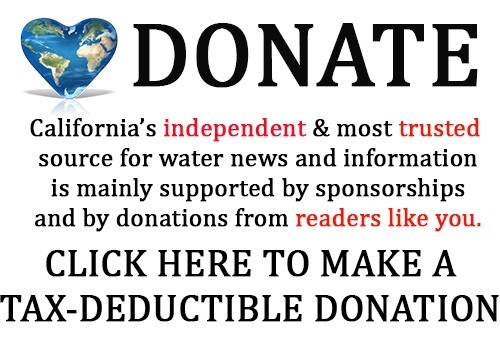 The San Joaquin County Resource Conservation District and American Rivers have been awarded Proposition 1 grants of $2 million from the Delta Conservancy and the California Department of Fish and Wildlife, respectively, to purchase flood and conservation easements on up to 2,000 acres in the acquisition zone for the purposes of expanding the Paradise Cut bypass. However, the Central Valley Farmland Trust holds an agricultural conservation easement on a 1,070-acre parcel within the proposed bypass expansion area, and acquisition of a flood easement on this parcel is essential to advancing the bypass expansion project. The Central Valley Farmland Trust (CVFT) is suggesting that acquisition of the flood or conservation easement, however, could potentially limit the potential future economic productivity of the property and could therefore be inconsistent with the agricultural purposes of the CVFT easement. Addressing the constraints of this easement has delayed progress on this project. 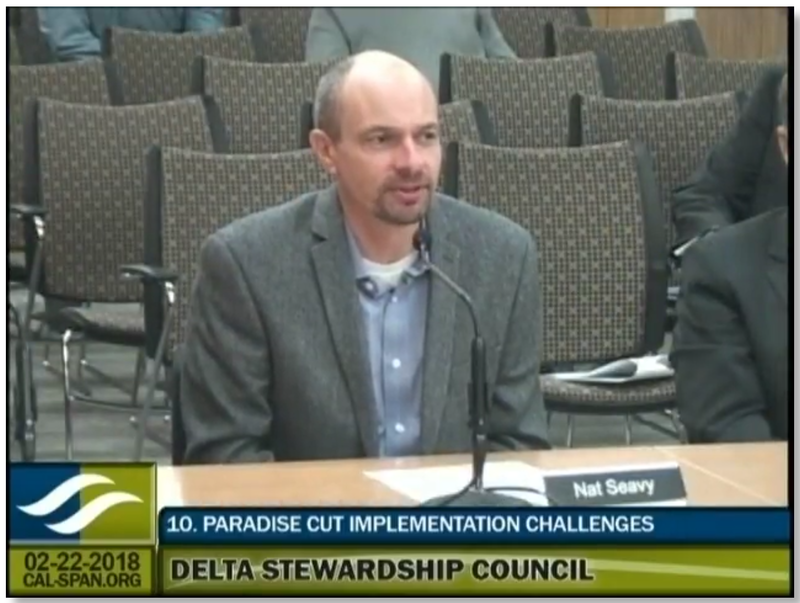 At the February meeting of the Delta Stewardship Council, a panel discussed how different easements control what can be done on the landscape and how this introduces challenges to moving forward even on broadly supported projects. 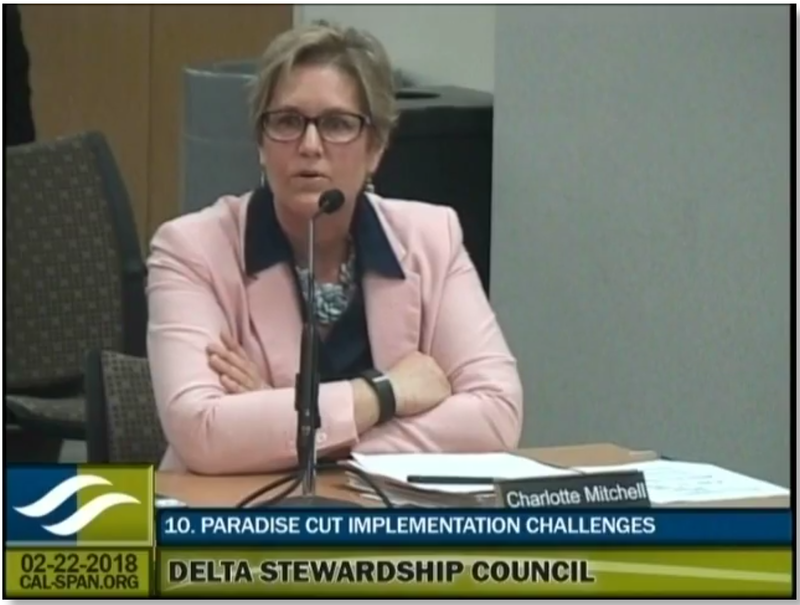 These are challenges that are likely to occur elsewhere in the Delta as projects are oftentimes proposed on lands with easements. As a result, the Paradise Cut project is a case study to help illustrate the challenges of implementing a broadly supported multi-benefit project with properties that have existing conservation easements. 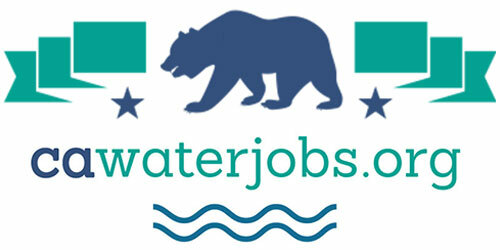 John Cain, Director of Conservation for California Flood Management with American Rivers. 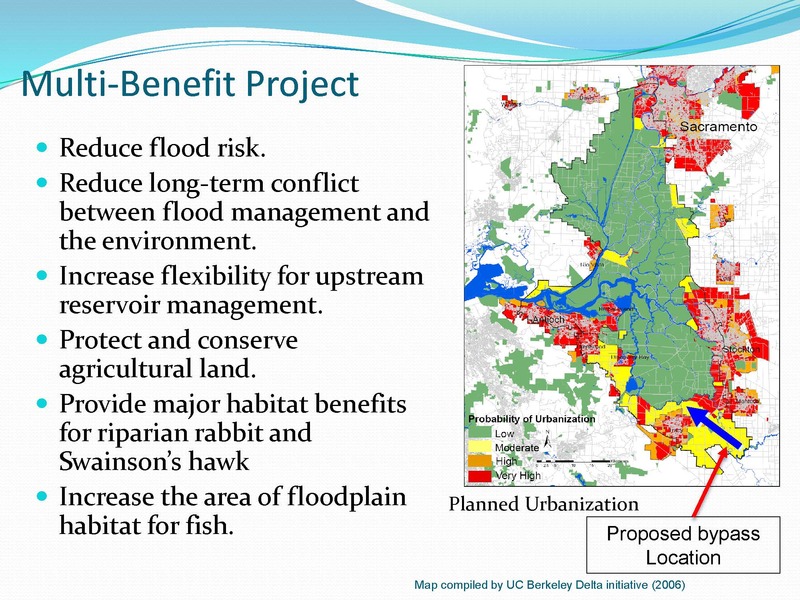 Mr. Cain will provide a NGO perspective on the multi-benefit project, specifically as it relates to achieving flood benefits, along with long-term habitat restoration measures. Charlotte Mitchell, Executive Director of the Central Valley Farmland Trust. Ms. Mitchell will cover what role the Farmland Trust has in protecting agricultural lands through agricultural conservation easements. Dr. Nat Seavey, Research director for the Pacific Coast and Central Valley group, Point Blue Conservation Science. Dr. Seavey will speak to some of the challenges of permanently preserving landscapes in a system that is changing due to climate change, sea level rise, and other stressors. Flood easement: Flood easements restrict encroachments and are meant to preserve the ability to convey water down the floodway, as well as preserve access for flood fighting activities and inspections of facilities during non-flood events. Agricultural conservation easement: Easements that address agriculture are written in a way that attempts to protect that space for the agricultural sector to continue to farm and to apply practices and crops that align with the market. Habitat easement: These can vary, depending on the specific objectives and the context. The intent is to establish and preserve ecological objectives on the landscape. In some cases, for certain species that have adapted to agricultural practices, this can coexist with agriculture; for other situations, it may actually conflict with agricultural conservation easements. 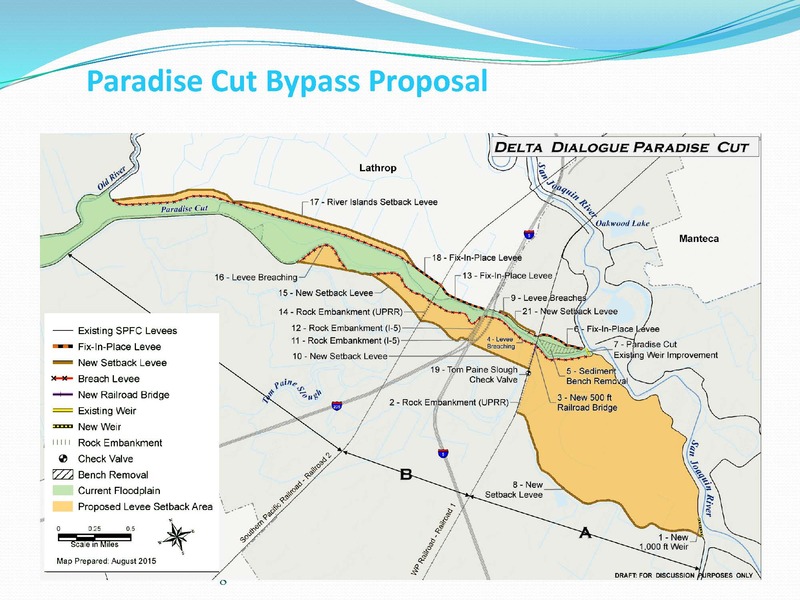 Mr. Melcer noted that flood easements often put limits on the types of vegetation communities that can grow in the floodway which can conflict directly with both of the other types of easements, which is what is happening with Paradise Cut. John Cain began by giving a brief overview of the Paradise Cut project. 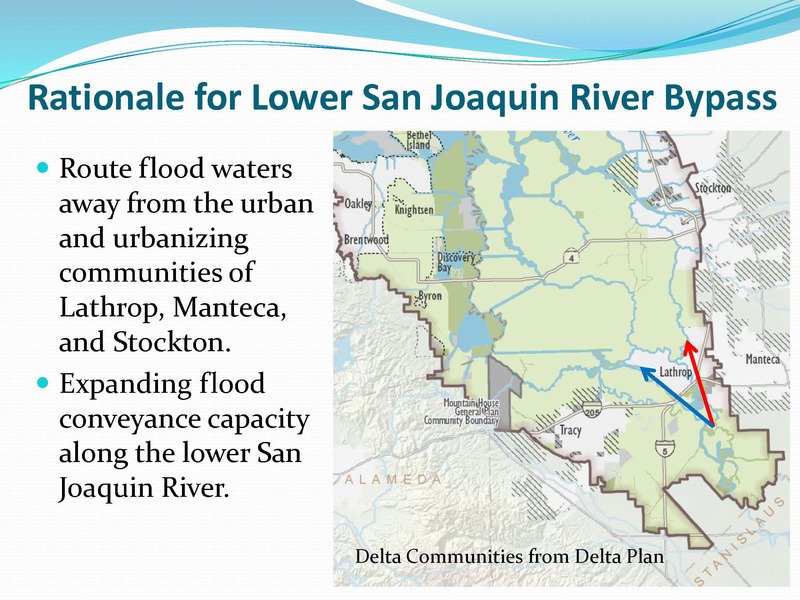 He presented a map, noting that the red arrow shows where floodwaters normally are conveyed down the San Joaquin, and the blue arrow is where the Paradise Cut bypass would be expanded to convey flood waters out of the urbanizing corridor between Manteca, Lathrop, and Stockton, and into the primary zone of the Delta. “It not only reroutes and redirects flood waters away from high risk urban areas like the Yolo Bypass does; it also expands the total flood carrying capacity of the lower San Joaquin River which has benefits,” he said. The Paradise Cut Bypass Expansion Project is a multi-benefit flood management project which would reduce flood risk and expand the capacity of the system; increase flexibility for reservoir management; protect and conserve agricultural land, both in the expanded footprint area and outside of the expanded footprint area; provide major habitat benefits for terrestrial species; and ultimately increase the area of floodplain habitat for native fish. 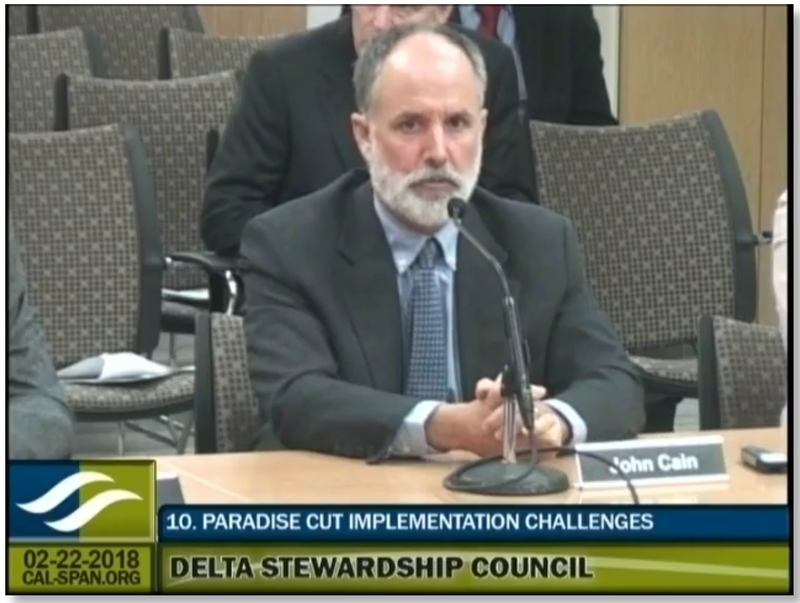 Mr. Cain noted that SB 5, which created the 200-year urban level of flood protection requirement, included discussion of Paradise Cut; the 2012 Central Valley Flood Protection Plan included Paradise Cut, as did the Delta Plan in 2013. 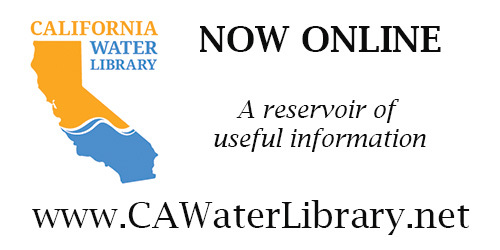 The 2017 Central Valley Flood Protection Plan reiterated the need for Paradise Cut. “We’re making some progress, but as you’ll see, we’ve got a long way to go and we’re going to need more than the passive voice to get this done,” John Cain said. The Paradise Cut project really hasn’t changed significantly since it was adopted as part of the flood plan, in terms of its footprint, Mr. Cain said. The green on the map is the existing Paradise Cut, which is a very small distributary channel of the San Joaquin; the yellow is the proposed expansion. In the lower right hand corner of the map, they are proposing a new weir approximately 1000 feet long; the floodwaters would flow into the expanded area, much like a forebay, attenuating the peak flows, and then it would flow down the existing Paradise Cut. 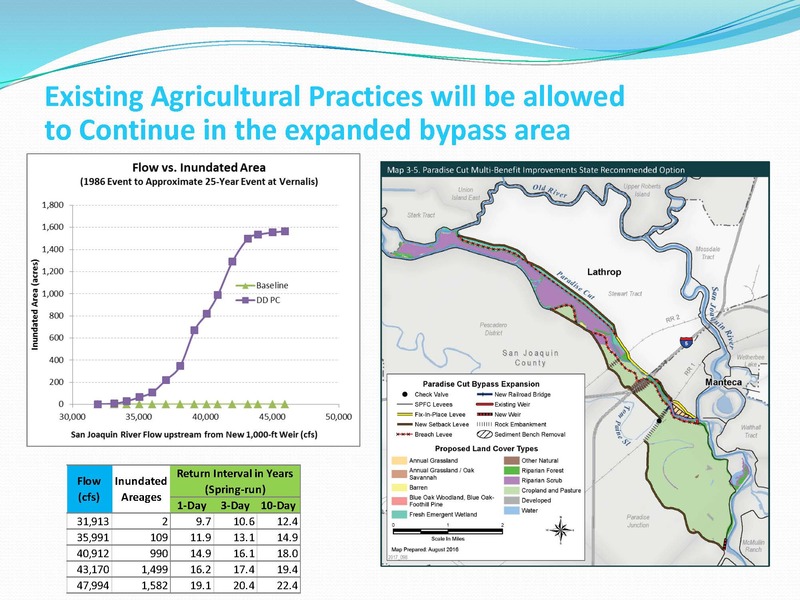 One of the key reasons the project has a lot of local support is that the modeling shows that the extended bypass area would only get inundated once every 12 years, so the existing agricultural uses of the property, currently field crops, would be able to continue largely unchanged with this new flood bypass. The Paradise Cut Bypass Expansion Project is included as one of three keystone projects in the Central Valley Flood Protection Plan. American Rivers and the San Joaquin Resource Conservation District have received a grant from the Delta Conservancy to implement a $200,000 planning study. Meanwhile, DWR is conducting a more detailed engineering design. There is $4 million in grants available to purchase easements and American Rivers is currently negotiating with landowners to purchase flood and easement acquisition on the 2000 acres necessary. There is additional funding available through Prop 1, so they have enough funding for all the acquisitions necessary. They already have appraisals on 3 properties that constitute 70% of the bypass expansion area. 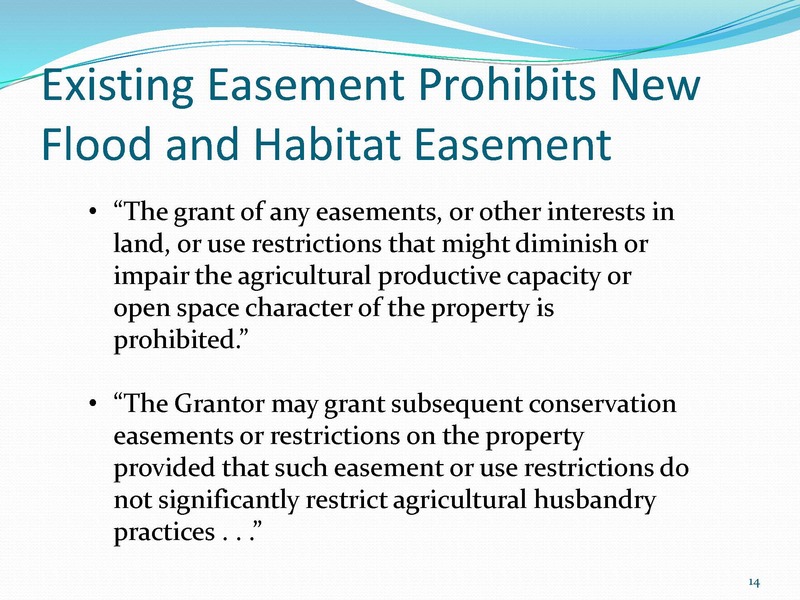 Mr. Cain said they’ve heard arguments that the flood easement wouldn’t really impair capacity, because the land is being used for its highest use, but the language in the second bullet is what makes it challenging: ‘The grantor may grant subsequent conservation easements or restrictions on the property, provided that such easements or use restrictions do not significantly restrict agricultural husbandry practices,’ meaning it doesn’t restrict the type of crops that can be grown. So American Rivers has been working with the Central Valley Farmland Trust in trying to figure out how to resolve the conflict. They convened an expert panel to advise them, who told them, ‘yes, you have a conflict, and there are not a lot of good legal options here for resolving this conflict.’ They noted that the easement is perpetuity on the property, and a restriction on trees and vines would be in violation of that easement. If the Central Valley Farmland Trust agreed, they could get sued; DWR could say the easements are in conflict and decline to commit to the project with the legal uncertainty. The Central Valley Farmland Trust is a non-profit agricultural organization that works with landowners and farmers to put agricultural conservation easements on their land. There is a selection criteria to ensure that the properties are prime and appropriate to protect in ag conservation. The easement is a private contract between a willing seller and the Land Trust and is held in perpetuity. 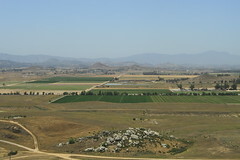 The Central Valley has real uniqueness in terms of its prime soils, its climate, and its producing food, not just regionally but around the world; it also provides a working landscape for the environment, a viewshed, space between cities, and a variety of other things, she said. Dr. Nat Seavey is a wildlife biologist with Point Blue Conservation Science, a non-profit organization that works across the state to look at opportunities to protect ecosystems for the benefit of wildlife and people. With California’s growing population, there is increasing pressure for development, so easements are a fantastic tool in terms of protecting farms and protecting ecosystems from expanding urban sprawl, he said. It’s important to come to a good solution to the conflict in Paradise Cut, because it likely won’t be the last time that we run into this kind of situation, and it’s going to happen more as we think about rising sea levels and how we manage places differently as the environment continues to change, he said. Looking beyond Paradise Cut, it’s important to make the conservation mechanisms we put in place flexible and adaptive in the way that they need to be. I think the easements remain an extremely important tool, and there are ways that we can look towards designing those easements such that they provide greater flexibility. Chair Randy Fiorini asked Charlotte Mitchell if there is any thought to adjust the covenants of future easements to accommodate this situation we find ourselves in? Click here for the staff report on this agenda item. Click here to watch this meeting on webcast.